Some of them graduated more than a half-century ago, but these alums still retain fond memories of the business school that grew into Kellogg. They recall how their academic experiences here changed their lives. The year was 1949, a year that saw the creation of NATO, the publication of Orwell's 1984 and the invention of silly putty. It was also a time when Northwestern University's enrollment swelled by 30 percent to hit record levels. Students flooded the campus, thanks largely to the GI Bill, a new program that rewarded WWII veterans by paying their college tuition. Many of those veterans, including John Lapperre, Stanley Bratt (both 49) and Karl Abt 48, discovered new opportunities at the School of Commerce, Kellogg's predecessor founded in 1908 and located in downtown Chicago. "The business school was a very different place when I was there," Lapperre says. "Most of the students were just starting their business careers. Accounting was the most popular degree, as bookkeeping was a recognized occupation. I worked full-time and took classes at night. Wieboldt Hall was the heart of the Business School back in [those] days, and it still is a strong place for Kellogg." Lapperre, who turns 90 next March, has a rich resume. He spent most of his career with Pullman-Standard, a Chicago manufacturer of railroad and rapid transit cars, where he retired as director of planning. He has authored several articles for professional publications and is an emeritus life associate of the National Association of Accountants. 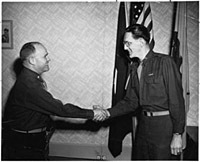 During World War II, Lapperre served as a lieutenant colonel in the Army and was awarded the Bronze Star Medal for meritorious service for operations in North Africa and Italy and the Croix de Guerre avec Etoile de Vermell for exceptional services rendered in the liberation of France. Stanley Bratt like his peers, completed college with the help of the GI Bill, majored in accounting and graduating with a bachelor's degree in business administration. He then took graduate business courses in the evenings at Wieboldt.Bratt remembers intense competition for admission in the years following the war. "I was able to return to Northwestern because I had gone to the [university's] summer school before being drafted," he says. 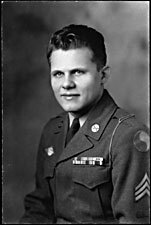 During his hiatus from Northwestern, Bratt served as a sergeant in the 69th Infantry. His unit took over positions after the Battle of the Bulge and met the Russian forces at Torgau along the Elbe River. After the war, Bratt held accounting positions at Walgreen's, the real estate firm of McLennan Company and Fleming Sales Company. "Fleming was thrilled I was a Northwestern graduate and so I got the job," reports Bratt, who worked at Fleming for 18 years before retiring. These days, he maintains a small practice as a tax accountant. Karl Abt is another alum from the post-war boom years. Until recently handing off the baton, Abt had been the representative for the class of 1948 for 30 years. "Before I was called into service I was working on a chemistry degree," Abt remembers. "When I came back three years later, I decided to go into the business school." Abt was in the Military Intelligence Service of the army. His team served with a task force built around an armored infantry battalion in France, Belgium and Germany. Abt's resume includes Oliver Farm Equipment Company, now part of White Motor Company, Ford Motor Company and Field Enterprises, Inc. When he retired in 1989 he started his own CPA practice, which he continues today. These alums agree that they received an outstanding education at Northwestern and still feel connected to the school. "Wherever I've been, my Northwestern degree has always been highly respected," Abt remarks. "Things we learned there still pertain today." "My business degree helped me tremendously," agrees Lapperre, "I went to Northwestern to establish my career. Up to that point, I had been a commercial accountant. In the business program, I acquired not only the tools of my trade, but analytical skills, which helped me enormously." Lapperre, like others of his classmates, has kept close ties with the school and often stepped in to help. When the time came to expand Wieboldt Hall, which now exclusively houses part-time evening students, Lapperre served on the advisory board and was instrumental in raising money for the $15 million renovation project completed in 1998. Similarly, he has remained active at Kellogg as a member of the Dean's Council, and served as the Gift Chair for his class during their 50th reunion where his efforts spearheaded a fundraiser that generated over $500,000. Lapperre received a Northwestern Alumni Merit Award in 1983 and a 1996 Kellogg Schaffner Award, given for outstanding service. Wade Fetzer 61, who attended Northwestern's Business School in an entirely different social climate than the post-war alumni, shares their feelings of commitment and appreciation to the school. "I feel I dodged the bullets," Fetzer says. "It was after Korea but before Vietnam. It was a peaceful time. The stock market was strong. There was no oil embargo, no campus turmoil." Commercial banking was one of the most popular fields in business when he attended. However, Fetzer wanted a career in investment banking. "My career in investment banking is largely the result of some fabulous professors I had along the way," says Fetzer. "I knew at that time what I wanted to do, but didn't know how to get there. Investment banking firms weren't interviewing at Northwestern. Northwestern wasn't on their radar screens. Now investment bankers are among Kellogg's best customers! My business degree gave me the tools and pointed me in the right direction." Fetzer's MBA led him to the Goldman Sachs Group, where he became a general partner in 1986 and a limited partner in 1994. Today, semi-retired, he's an advisory director at Goldman and spends most of his time doing community service, including work for Kellogg where his is chairman of the Kellogg Alumni Advisory Committee and a recipient of the school's Schaffner Alumni Award. "Dean [Donald] Jacobs asked me to chair the advisory board," explains Fetzer, who points out that at that time Kellogg did not have a competitive advisory board structure. Fetzer was instrumental in recruiting board members and developing a structure. "Our function is to support Don Jacobs in any way he needs, and to work closely with him on his initiatives," Fetzer says. In the last decade, Fetzer believes he and his peers have built a successful advisory board. Its members, past and present, are deeply committed to Kellogg, contributing both time and financial support. Fetzer echoes the feelings of many Kellogg alums when asked why he has devoted so much energy to the business school. "I'm thankful for what I got at Kellogg," he says, "and this is my way to say thanks."